This equatorial dial 1 meter in diameter. Made of iron, it has both an equatorial and meridian arc. There is an east-west thin vertical hoop that holds the arcs together. The sundial gnomon is an arrow held by the meridian arc and pointing to the north celestial pole. 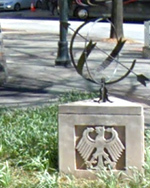 The dial rests on a triangular base that has the German eagle carved on all three sides. An analemmatic dial in brick and stone. A calendrical dial consisting of six granite slabs and standing 19 feet high arranged as a center stone with four surrounding stones and a capstone. A channel through stone indicates the celestial pole and a horizontal slot indicates the annual travel of the sun. The stone faces are engraved with ten guidelines or principles in eight different languages.